I listen to a lot of audiobooks driving in the car or riding around on my bike. It's very rare that I will listen to a book as an audiobook and then read it as a book book. 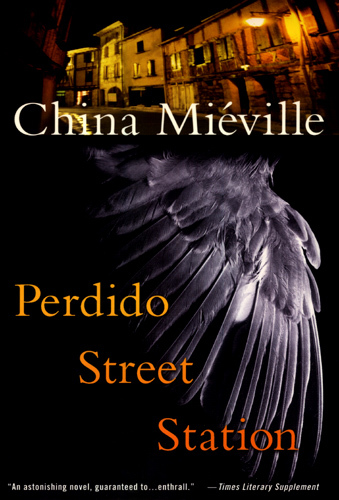 China Mieville's Perdido Street Station is one of the few recent cases where I've done that. I have no idea who did the audio because I got it as a torrent but it was read and produced very well. Reading it is a different experience - much less intense and immersive, but I still liked it a whole lot. It's a fantasy novel set in the city of New Crobazon which is a cross between William Burroughs's Interzone (Tangier) and London. The city is populated by many different sentient and semi sentient races and other peculiar creatures. It's a steampunk nineteenth century city with science complimenting a ubiquitous low level magic. We follow the story of Isaac (a human) and Lin (who has a more or less human female's body with a beetle's head (not quite the full Kafka)) who are in a frowned upon and possibly illegal relationship together. Lin is an artist with a repulsive new client (who wants a self portrait) and Isaac is a scientist/thaumaturge who gets a job working for a garuda - a desert dwelling sentient bird like creature - who has lost his wings and wants Isaac to make him a new set. That takes you to about page 100 of 600. If you like fantasy you really should try Perdido Street Station and if haven't read any fantasy novels since The Hobbit and Lord of the Rings this could be a good place to start. 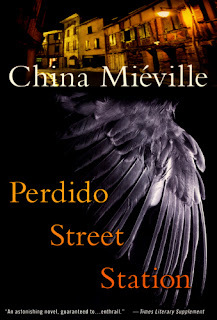 As I've said in another place - Perdido Street Station is one of the best and most important fantasy novels since the 1970's and China Mieville is certainly a pretender to Neil Gaiman's throne as the genre's most exciting talent.